Maggie brings creativity and modern expertise to JGR. She is passionate about working in the architecture and construction industry. For her, watching the design and construction process unfold and viewing the end product is genuinely fulfilling. Every day presents something different and exciting. 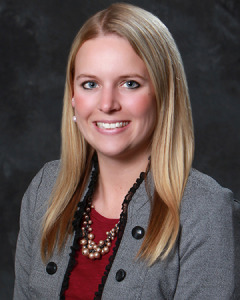 She is avidly involved in the community as the Vice President of the Salina Area Young Professionals Steering Committee, a member of the Friends of the Smoky Hill Museum Board, Chairwoman for the Downtown Design Review Board and volunteers at the Salina Animal Shelter and United Way. Her knack for learning computer programs quickly and creating renderings for clients has proven her capabilities and talent. She just completed assisting the team on a major renovation and facelift to an existing convention space that was dilapidated and neglected and has now transformed into a unique addition to the Salina downtown area, now known as Assurance Partners. She was a team member in the collaboration of the First Covenant Church-Faith and Family Life Center, a modern and trendy space for the youth to use for worship, dining, and social activities. In addition, she was a key team member in the design of the KSU Bulk Solids Innovation Center that will offer a research center to be used by the community and other companies throughout the country. These are just a few of the many projects Maggie has been involved in. Having lived in Salina for over 25 years, she enjoys watching the community grow and prosper, as well as being close to friends and family. Being an active Alumna of Kansas State University, she spends a majority of her fall Saturdays at Bill Snyder Family Stadium or cheering on the Wildcats when they are on the road. In the summer, you may find Maggie spending time at the lake: boating, fishing and swimming. When she’s not at work, her two dog’s get most of her attention playing fetch and going to the park.